Co. Tyrone: Aghintain, Augher (2), Aughnacloy (2), Ballagh, Ballygawley (2), Cecil (2), Clogher (2), Cole, Cullamore, Errigal, Favor Royal (2), Fivemiletown (2), Foremass, Killyfaddy, Tullyvar. The Board also included 8 ex-officio Guardians, making a total of 32. 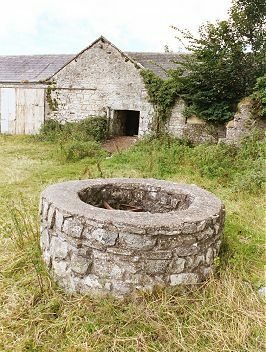 The Guardians met for the first time on 27th May 1841 at Clogher courthouse. Later, their regular meetings were held each week on Saturday at the workhouse. The population falling within the Union at the 1831 census had been 38,855 with divisions ranging in size from Bragan (population 1,132) to Cecil (3,902). The new Clogher Union workhouse was erected in 1842-3 on a 9.5-acre site at the north of Clogher. Designed by the Poor Law Commissioners' architect George Wilkinson, the building was based on one of his standard plans to accommodate 500 inmates. Its construction cost £4,900 plus £885 for fittings etc. The workhouse was declared fit for the reception of paupers on 9th March 1844 and admitted its first inmates on the same day. The workhouse location and layout are shown on the 1909 OS map below. 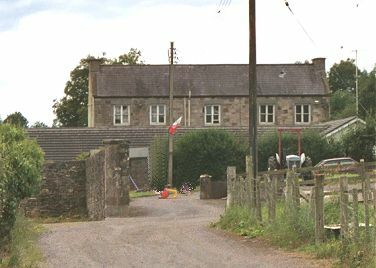 Clogher entrance block from the east, 2003. 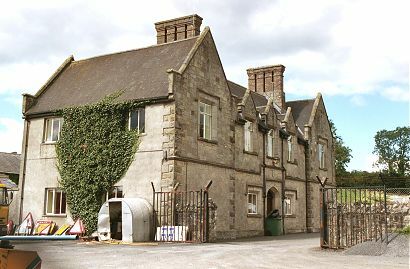 Clogher main block from the north, 2003. Clogher rear of main block, chapel and infirmary from the north-west, 2003. During the famine in 1846, a 32-bed fever hospital was erected at the west of the workhouse. Attic space was turned into additional dormitories, and a house was hired in Clogher in which to accommodate 100 boys. Clogher fever hospital from the north-east, 2003. Amongst the best cultivated grounds in the North of Ireland are those of the Clogher Union... Here you may observe almost every variety of vegetables, viz: potatoes, cabbages, onions, celery, cauliflowers &c. The walks are kept in as good order as those of any fruit garden. Immediately in rear of the house is the cemetery, consisting of sufficient ground for about a hundred graves; and the Episcopalians, the Presbyterians, and the Roman Catholics have each their own burying ground particularly allotted to them. A wall was later erected to separate the burial ground from the fever hospital. 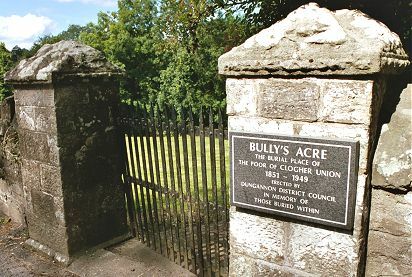 When it became full in 1849, a new graveyard known as Bulley's Acre was set up at Ballymagowan Bridge at the east of the workhouse. Clogher burial ground from the south-east, 2003. At the 1901 census, the population of the Union was 14,316 with 9 officials and 92 inmates in the workhouse. Clogher workhouse closed in September 1916. Able-bodied inmates were moved to Armagh and Enniskillen. Inmates in the infirmary remained in residence in what became a cottage hospital until 1948. In 1953, the hospital was converted for use as an old people's home which operated until 1990. In 1993, the building reopened as a private nursing home. The main building was sold for £400 in 1916 to one of the Guardians, William Coote MP, who converted it for use as a woollen goods factory. At the end of the 1930s, the factory was taken over by Messrs Armstrong and Lang for use as a mushroom-growing plant and for housing cattle and machinery. The front block was later used as local council offices. Masters/Matrons: Robert and Rebecca Robinson (1843-50), James and Anne Duncan (1850-57), Hung and Eliza Lynch (1857-73), John and Matilda Wright (1873-1906), George Evans (1906-). Clerks: James Burns (-1857), Hugh Lynch (1857-73), Jack Scraggs (1873-98), Thomas Turner (1898-1914), John McCrea (1914-). Public Record Office of Northern Ireland, 2 Titanic Boulevard, Titanic Quarter, Belfast BT3 9HQ. Holdings include Board of Guardians' minutes (1841-1948); Workhouse registers (1863-1949); Indoor admissions and discharges (1907-48); Indoor relief lists (1908-46); Masters' journals (1916-49); Porters' books (1910-26); Chaplains' book (1903-30); Tobacco books (1908-16); Reports of visiting committees (1903-16); etc.